On this day 40 years ago, Neil Armstrong and Buzz Aldrin became the first humans to walk on the Moon. This was quite an achievement for mankind and a key milestone in world history. 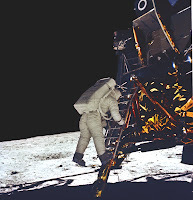 To commemorate this event the Command Module code (Comanche054) and Lunar Module code (Luminary099) have been transcribed from scanned images to run on yaAGC (an open source AGC emulator) by the Virtual AGC and AGS project. For more information on this project, I recommend looking at the website and the open source project. As the project evolves, look for syntax highlighting done with a special extension for google-code-prettify. First one to find a bug should get a prize. Wow, seriously. Looking at this puts what I do into perspective. Thanks for taking the time to get this piece of history out there! yeah, that code seems to land in MGM studios rather than the moon, am I reading the code right. "NUMERO MYSTERIOSO" on line 666 of the LL Guidance Equations, too. The author of some of this code, Don Eyles, has a great article about two life-threatning bugs. Can't post the URL, search for "TALES FROM THE LUNAR MODULE GUIDANCE COMPUTER"
line 257: XCH TEMPBETA # OVFL NOT EXPECTED. Does the source code mention anything about Nazi science or the slave labor from Buchenwald that Wernher von Braun used during his development of rocket technology? i'd like to see source from NASA's Spirit and Opportunity robots. i would like to see the high level language MAC (MIT Algebraic Compiler) they supposedly used for development. There's a summary of an interview with the principal designer of the LM descent software here. There's no "FILE NOT FOUND" message or "Press any Key to Continue"
How would they catch a stack overflow exception? What would have happened if they found these errors? I am getting the "A Disk Read Error Occured. Press CTRL+ALT+DEL to restart"
looks like they used 8 decimal points of pi to fly to the moon. Don Eyles is a pretty cool guy, it's interesting to see him in that picture from 40 years ago - same man but with glasses and white hair. He once displayed some Apollo artifacts as part of an art exhibit in the neighborhood I lived in, including that same LUMINARY tome and an actual memory module. Fascinating stuff! It looks like you're landing a spaceship. Think thy touched down in 1969 ? Can you tell whether it is this Apollo Guidance Computer (AGC) that displayed an "error 1202" during Apollo 11 landing on the moon and forced Armstrong to moonland manually ? I can see a Guildenstern, but where's Rosencrantz? What happens if Rosencrantz and Guildenstern are dead?